We stand by our mission and promise to provide our customers with quality pianos, service and support. Treating each customer like an exclusive endeavor with special emphasis and attention to detail is key in providing the highest level of satisfaction that will enhance every musical experience. A customer coming to us all the way from Texas had a great experience restoring their rare A.H. Gale Square Grand Piano. The restoration at our location in Weaverville went exceptionally well and they wrote us to tell us about their great experience. Reading kind words from another satisfied customer makes us so happy, because that’s exactly what we set out to do; satisfy our customers. 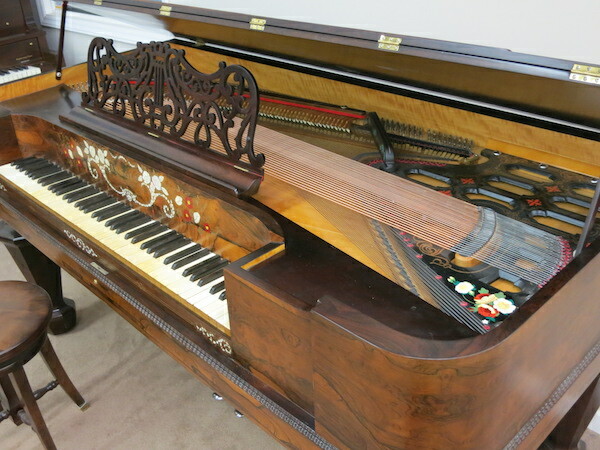 Mr. Shane Owenby at Piano Emporium has completely restored a rare, A.H. Gale square grand piano of ours that was a family heirloom, over 160 years old, and in poor condition. 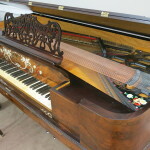 [The A.H. Gale piano company was established in 1837 as the New York Piano Manufacturing Co. The name was changed to A.H. Gale & Co. in 1845. It was discontinued in 1870.] We went to his store in Weaverville, NC before the work began. He graciously and patiently explained the restoration process to us and helped us understand the details of the work he would do. He also helped us arrange a delivery of the piano from Texas to North Carolina. Once the work began, he furnished pictures all along the way of the progress. He also was prompt in replying to questions we had. I always felt I was in the know about how things were going and the stage of the work. The work was completed in a timely manner. He expertly advised us of the best way to proceed, explained that many intricate parts would have to be hand made of wood and leather, and had hand painted details and insets completely restored. It was amazing to see the transformation from a dust laden and unplayable musical mess to the instrument of beauty and enjoyment it is today. I highly recommend Shane Owenby and praise the work he did for us. He and his crew personally delivered our piano to our home in Texas and set it up and Shane tuned it before he left, which was a two day process. It is obvious to me that he and his crew took great pride in their work, and I believe them to be men of high character. If you have any questions on square grand pianos, piano restoration or piano moving services, please contact us at any time – we will be more than happy to help you!